Foundation of a building transfers load of the structure to the safe stratum. But always hard stratum is not available to support or economy of structure doesn’t allow designer to use deep foundation . In these cases engineers need to depend on shallow foundation or foundation not supported on firm stratum. Even in case of pile foundation, there need to check for settlement of pile group. In case of clay deposit long time settlement is very important and in case of construction where project duration is limited the time required to achieve desired degree of consolidation is very important. 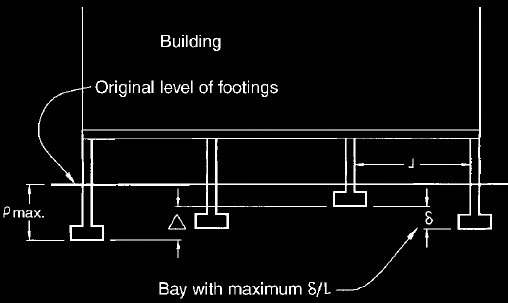 This is a relative settlement defined as largest difference between settlements of two different foundation of same structure as shown in fig above. There should not have any doubt that maximum differential settlement (Δ), not necessarily to experience near foundation suffering maximum settlement. Any two foundations having maximum difference in settlement are considered here. During construction work gradually loads are applied to foundation soil say 2-3 years or may be several years where skyscrapers are founded. Some structures need to go in operation within shortest expected duration say highway, dam etc. when socio-economical or political aspects are considered. So we can leave some settlement during its service and essentially safe fraction of consolidation before structure is left to service. In this regard we have to know rate of settlement as most construction work have time constraint. Again settlement consideration for building is not same for highway construction. Different methods are introduced by geotechnical engineers to change rate of settlement, some have discussed here discussed in this blog, and some are coming soon. This term is expressed as δ/L. For the expression we can easily realize that it is nothing but differential settlement (not maximum differential settlement) between two locations in foundation soil divided by distance between two locations but should be less than tilt. Now what is tilt? MacDonald and Skempton (1986) defined this term as rotation of entire structure. The maximum angular distortion is the highest value of δ/L as shown in fig above, again the location of maximum angular distortion not necessarily to locate at maximum settlement or total settlement. Now how these parameters are used in foundation design? At first total/maximum or maximum differential settlement of structure proposed for in-situ soil conditions are determined. Thus allowable settlement rates are determined and finally they are compared to maximum settlement parameters. 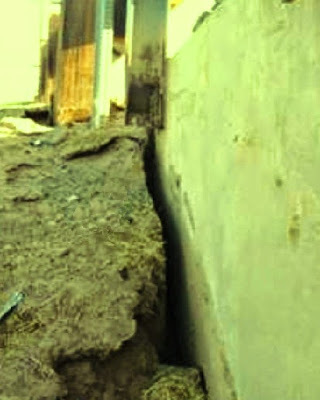 If these parameters exceed allowable settlement values, the foundation type required or required mitigation measures to limit settlement are designed.